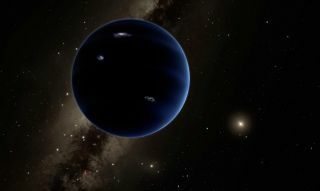 Artist's illustration of Planet Nine, a hypothetical world that some scientists think lurks undiscovered in the far outer solar system. The weirdly clustered orbits of some far-flung bodies in our solar system can be explained without invoking a big, undiscovered "Planet Nine," a new study suggests. The shepherding gravitational pull could come from many fellow trans-Neptunian objects (TNOs) rather than a single massive world, according to the research. The hunt for Planet Nine — or, as some prefer to call it, Planet X or Giant Planet Five — began in earnest in 2014. That year, astronomers Chad Trujillo and Scott Sheppard proposed the existence of a large, unseen "perturber" beyond Neptune, whose gravitational influence could explain oddities in the orbits of distant objects like the dwarf planets Sedna and 2012 VP113. The case has been building ever since, as astronomers have found more and more "clustered" TNOs; the tally is up to about 30 at the moment. But Planet Nine's existence isn't a slam dunk: Some astronomers think the orbit-shaping tug is more likely coming from many small bodies. The new study, which Sefilian conducted with Jihad Touma of the American University of Beirut, explores this latter scenario. The duo's modeling work suggests that the strength-in-numbers explanation does indeed work — if the mass of the Kuiper Belt, the ring of bodies beyond Neptune, is a few to 10 times that of Earth. This is a pretty big "if," given that most estimates peg the Kuiper Belt's mass at less than 10 percent that of Earth (and one recent study put the figure at 0.02 Earth masses). But other solar systems are known to harbor massive disks of material in their outer reaches, Sefilian and Touma noted. And our failure to spot one around our own sun doesn't mean it doesn't exist, they stressed. "The problem is, when you're observing the disk from inside the system, it's almost impossible to see the whole thing at once. While we don't have direct observational evidence for the disk, neither do we have it for Planet Nine, which is why we're investigating other possibilities," Sefilian said. "It's also possible that both things could be true — there could be a massive disk and a ninth planet," he added. "With the discovery of each new TNO, we gather more evidence that might help explain their behavior." The new study has been accepted for publication in the Astronomical Journal. You can read it for free at the online preprint site arXiv.org.